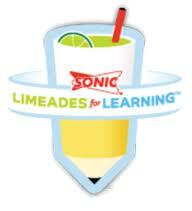 Each year Sonic sponsors an event called Limeades for Learning for the purpose of providing classrooms with those extra tools needed to enhance the learning of our students. Teachers write up their projects and submit them online. The list of projects from all over the United States is then voted on (and donated to) by visitors to the site. Votes are limited to one per day for each email address. At the end of each week for five weeks, the projects with the winning number of votes are funded completely by Sonic. Congratulations to three of our White Oak Teachers who took the time to write, submit, and solicit votes for your children. Second grade teachers, Mrs. Saccoccio and Mrs. Richeson, will be receiving iTouches for their classroom, and third grade teacher, Mrs. Hunter, will be receiving a digital recorder and microphone for her students. It is still not too late to submit YOUR projects and start to get the votes coming in for your students. We are waiting to give you our VOTES!